Robin was a former newspaper editor and director and finally in tourism marketing in Cumbria. Patricia worked as a housekeeping supervisor in 4-5 star Cumbrian hotels and both decided that retirement was the next exciting stage of their lives. They took the first steps to a new life in Crete, Greece in 2004. A big decision, but with careful planning it became exciting and very enjoyable. Please check out their Robin's Nest...Crete website. They say that life is a gamble. For many the gamble is never taken, for others it is the first step to a new and exciting life. Leaving family and friends back in the UK to start a new life after retirement is a massive step and one that had to be considered carefully. Not only where to go to but all the regulations and paper work has to be correct of course. It is no use just sticking a pin into a world map – careful consideration has to be taken into account. 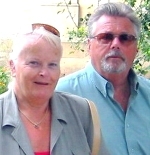 My wife Patricia and I made the decision was made to retire in 2004. I had worked in newspapers from an early age, through the ranks to become an editor, a director and co-founder of an evening newspaper, and then into tourism marketing. Patricia had worked in the R & D laboratory of Duracell and finally in five-star hotels as housekeeping supervisor in the Lake District. We made the decision to sell up our home in Cumbria. Many thought we would be heading for the new life in Spain or even Cyprus, they were never on the list. It was America as a first thought, but visa regulations, even with family there, never allowed beyond the perhaps stage. We had been to Greece and its islands many time, enjoying the lifestyle, particularly the island of Crete, and it was Crete we decided was the place for us. As a newspaperman it was natural to seek out the nuts and bolts of information needed. A dossier was compiled, sourcing the need for medical and legal requirements. Medical was the first sourced. As a member of the EU you go to the local IKA (Greek’s public health system) office in the area in which you will reside. Taking all papers with us it was easy. The helpful staff filled in the forms, sent them off and a week or so later, fast by Greek standards, we had our IKA book. This is needed when you go to an IKA doctor. Finding one is easy; the police station always has the information. Pharmacies complete entries in the IKA book for prescription and you pay a small percentage for medicines. If you want you can reduce this to zero, but this entails a trip to one of the bigger towns on the island and going through the process. Housing was always the biggest decision – to buy or rent? In our case we thought about renting for a while, but soon realized we wanted a house of our own. We had been to the island before and knew a great deal of the eastern side. We booked a one-week trip to Chania to meet with estate agents. These were easy to find on the internet, many had details of property available for purchase. We settled for e-mails to six companies to meet us and to spend a day looking – all were helpful, but in the end nothing caught our eye. We returned to the UK, but a couple of weeks later I came out to the east, stayed a week in a room by the sea. With the aid of a friend we knew on the island I found six houses that might meet our needs and then returned to UK. Our Cumbrian house sold and it was time to find a house in Crete. A flight was booked to Crete and we stayed in the room I had on my previous visit. Cretan people are hospitable and the couple who owned the room said we could stay as long as needed, even suggesting some properties, however, by pure chance we saw in an agency a private advertisement for a traditional stone house, in reasonable condition in the village of Pano Hersonissos. Minutes away from mini-markets, grocers, butcher and a baker, and two miles from the sea – perfect. The house was owned by an American who had already completed major work on electric, plumbing and tiles – it needed finishing – just what we wanted. In Greece, when buying a home you need a lawyer and transactions are made through him and the notary. All dealings were in English, and, amazingly, from the time we agreed to purchase the house and agreed on a price, it was ours within two weeks. First step to complete things was a trip to the police to obtain a residence permit, needed to buy a car. We also instructed our couriers in England to send our households goods. This was the only problem we encountered as container ships were not being allowed into Piraeus during the time of the Olympic games, but, by September all was delivered and work on finishing the house could begin. Since arriving, our Greek has improved, although we both understand more than we speak, but it has never been a problem as the Cretans are hospitable. If you at least try and integrate into the community where you can, they respond and appreciate it. We joined a senior citizens group called KAPI, a social society that arranges trips and excursions over the island and further afield – best move we made on the island. You have a problem? It becomes their problem, you cannot expect more than this. We love the island; we love the village and have always been made to feel welcome. Our area does have some English ex-pats, but also others from Holland, Norway and a smattering of other locations. Other parts of the island have large communities of ex-pats – but it was not for us – we wanted our island to be – just what it is – Greek and friendly. Oo on take that first step, we are glad that we did, and only regret that we did not do it earlier. Thank you for a very interesting article. Its been a dream of mine to retire in Crete and although retirement its still a number of years away, this has given me a great deal of confidence in the process.